In case I ever come back to Kyiv or when someone asked me for recommendations in Kyiv, I wanted to put my favorites in writing. 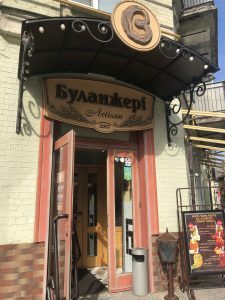 During our month in Kyiv, I visited about 25 coffee shops and bakeries. While you might find that slightly excessing, sadly there were at least 10 others on my list that I didn’t get to during our month. 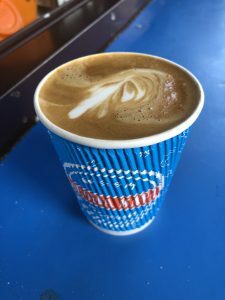 Initially, I thought I’d keep a running list like I did in Amsterdam, but my list became way too long and while I had some really great coffee in Kyiv, I also had some bad coffee too. Before I dive in with my favorites, I think it is essential to understand how big the coffee culture is in Ukraine. I had no idea! “I think that Ukrainian baristas are among the best in the world,” says Slava Babych. The Ukrainian won the Cezve/Ibrik Championship in Dubai with 156 points – 51 points more than Russia’s representative who placed second. 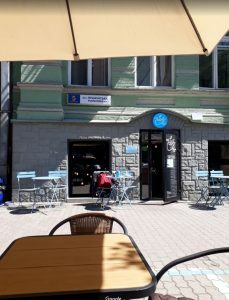 Also, coffee is everywhere in Kyiv. 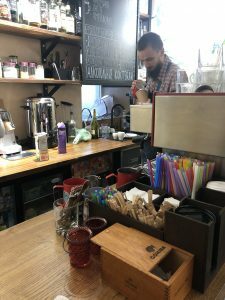 There are walk-up coffee stands every 10-feet in Kyiv. 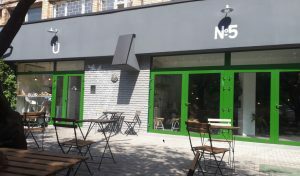 You’ll also find coffee bars in the underground tunnels, shopping centers, museums, barbershops, nail salons, hair salons, literally everywhere. There are also coffee vending machines all over Kyiv. 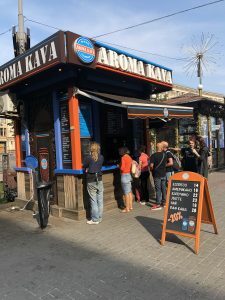 ^This is a walk-up coffee stand and the first coffee I had in Kyiv. It was terrible. 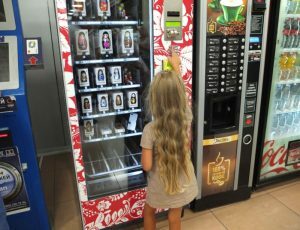 ^Here’s a coffee vending machine. I never tried it. 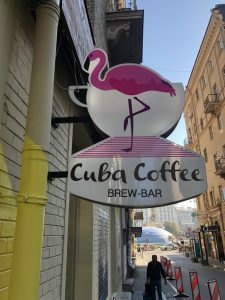 Cuba Coffee: This coffee shops was about 3-mins from our apartment and very quickly became my go-to coffee shop in Kyiv. Most days we started with a coffee from Cuba. Nolan’s standing order was a banana smoothy, which was very tasty. Jim always ordered a latte and my favorite was the flat white. They also have a really amazing Integram handle, which I started following — @cuba_coffee_kiev. Blur: Also really amazing coffee. I, of course, got a flat white. I would personally put it slightly above Cuba Coffee, but not by much. Blur was also about a mile from our apartment, so not really walkable to get my morning coffee. I got a couple bags of their beans for brewing at the apartment. I really enjoyed them, both were very smooth. I only went one time because it was a bit future from the apartment, but I am happy we found it. 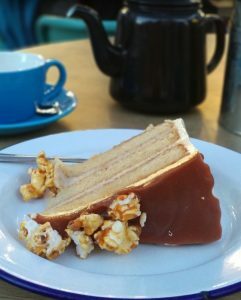 The Blue Cup Coffee Shop: I loved, loved, loved this place. All the cups were a cheery turquoise color; the cups alone made me happy. 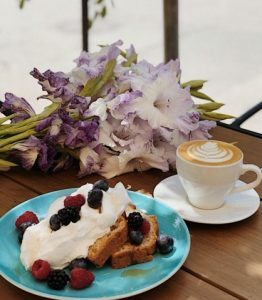 I tried a couple different types of coffee, but my favorite item on the menu by far was the Banana Bread with Coconut Cream & Berries. They also have a really amazing Integram handle, which I started following — @thebluecupcoffeeshop. It will give you small taste of how lovely this place is. 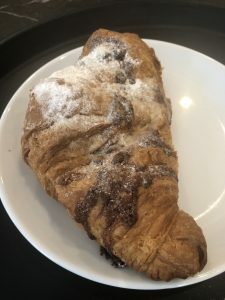 Boulangerie: The best croissant I had in Kyiv. I ate it while walking down the street and got a few strange looks, and then I realized the sounds I was making while eating. Coffee was terrible, but I did go back at least 4-times, twice in one day, for a croissant. Freshly baked, the croissants were warm and straight out of the oven. Full disclosure, Boulangerie is a chain, but I didn’t care. 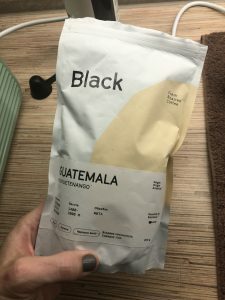 Black: The best beans I purchased in Kyiv. 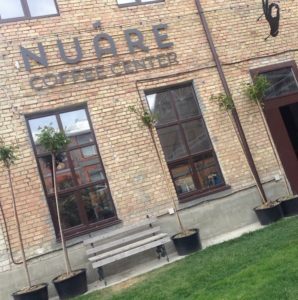 We found this coffee shop when we went to Comic Con, so it was no where close to the apartment. It was an actual roaster, so Nolan and I watched them actually roasting beans. 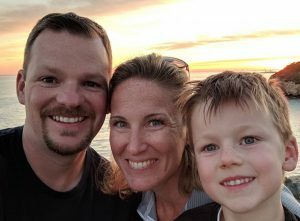 Dogs and Tails: It was super hard to find, but we didn’t give up on our search and finally found it. 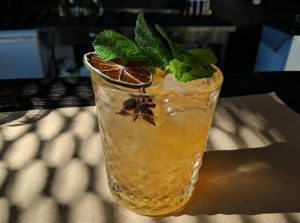 Super glad we did too, because they had the best cocktails! I got the spicy margarita and it was fantastic. Ok, ok … I got three … don’t judge me. 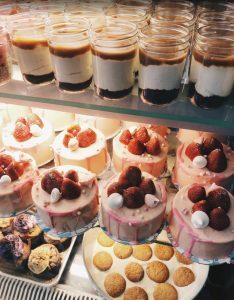 Milk Bar: Upon research, I believe Milk Bar is also might be a chain, but again, I do not care — this place had the best cakes and desserts. Jim and I went on one of our day dates. I got two desserts; the popcorn cake and the banana pudding. I order the banana pudding before our meal and the popcorn cake I got as a take away. I fully intended to share the popcorn cake with Nolan, but it didn’t make it. When we got home, Nolan was down for a nap and there was no way, I could wait 2-hours to try it. 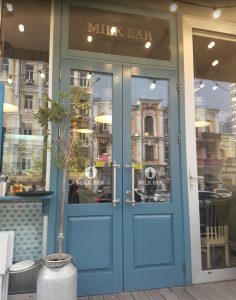 Our last night in Kyiv, I actually walked back to Milk Bar for one last serving of Banana Pudding. And with that, I will say Keep It Real Kyiv, catch you on the flip side.